Zynga has released the newest title in its casino brand of mobile games, Wizard of Oz Slots, on the Amazon Appstore as a one-week exclusive. 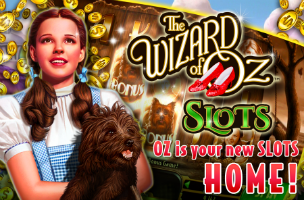 The game takes players to the land of Oz, and offers multiple themed slot machines featuring Dorothy, Toto, Scarecrow, Tin Man and the Cowardly Lion, as well as locations from the iconic film. The game’s first slot machine takes players to the film’s sepia-tone farm in Kansas, while future machines offer themes like Munchkinland, Scarecrow’s Field, the Apple Tree Forest and more. In each machine, players can change their bet per spin and can toggle auto-spin to keep the game running continually without further input from the player (so long as their are credits to wager). Machines may offer bonuses or mini-games as users play, like a tornado in the first machine that wipes out some symbols and replaces them with others (potentially increasing the gamer’s winnings). As players bet credits, they earn experience points and level up. As players level-up, they receive free credit prizes and will eventually unlock higher maximum bet amounts and new slot machines as they travel down the game’s very own yellow brick road. Players are encouraged to login with their Facebook account to receive free bonus credits, and players receive free credits by simply logging into the game every few hours. Some machines offer jackpots, but these are only eligible to players who wager a certain amount per spin. To earn even more credits, players can send free gifts to their Facebook friends, and will receive 50,000 credits for each friend that accepts a request. Wizard of Oz Slots is available to download for free on the Amazon Appstore. The game will come to iOS and Android devices soon.